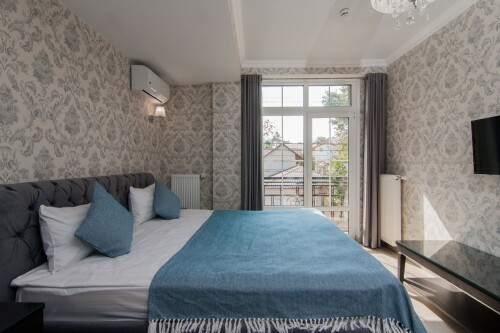 Hotel Klassik – is a comfortable hotel complex, which opened its doors in 2015, with a total area of 1900 square meters, which is located in the historical center of Chisinau, “stone’s throw” from the main street of the city. Hotel Klassik offers 48 rooms of different categories for every taste and 3 apartments. The price includes: breakfast (“buffet”), Internet Wi-Fi, access to terrace and 2 swimming-pools, fitness-room, parking 24/24. On the territory of hotel You can have a good time in our summer garden, on the terrace with gazebos and take a “sunbath” near of the pool. The elevator takes you to the 5th floor, where there is another outdoor pool and sun loungers, offering a magnificent view of the city! The restaurant at the Hotel will pleasantly surprise you with dishes of Moldavian and European cuisine. A cup of coffee or tea on the summer terrace near the fountain will help you to relax pleasantly! And you can conduct business negotiations in the conference hall of the Hotel! For an additonal fee, hotel guests can visit the spa area, where there is a 3rd swimming pool, a wood-fired Russian sauna and an infrared sauna.